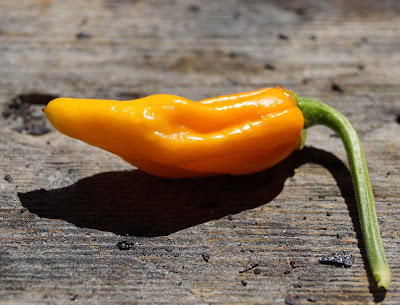 Our garden has several varieties of exotic peppers. This group of supper hot elite chile peppers boldly paint a colorful patch. One variety is the Ghost pepper. This pepper plant has a long growing season of 120 days. This bright yellow pod begged to be picked. I obliged and in the name of science and curiosity it needed to be tasted. Being careful not to actually touch the pepper with bare hands it was washed and cut into tiny slivers. A small sliver was popped into my mouth. I instantly received a lesson in humility. People have different and sometimes deadly reactions to hot peppers. My initial response was of flavor. A strong habanero, tropical fruit like pleasant taste greeted my sensors. Within seconds my mouth was assaulted by a rush of heat. This was a building heat that quickly was turning into a fire. Two minutes into my folly the heat was still climbing. My face was flush, my nose was running and I was aware that I needed to breath normally. Some people will have an ultra severe reaction of their windpipe swelling closed. I did not panic but wished for some relief. Water and alcohol can actually intensify the experience. Ms. Goofy offered a glass of milk. I was on this ride to the end without aide. Half an hour has passed. My nose is still running but the fire in my mouth has subsided. An hour has passed and my adventure with this Ghost pepper has ended. It was a wild ride. Would I ever do this again? I do have several more pepper plants in my garden. Stay tuned. Of course you will do it again! Your name is, after all, Chilebrown! Zoomie, Probably, but will have some dairy as back-up. Funny. Wish I was there to see it. Just a little chemistry to help out with your next experience. The capsaicin molecule has base functionality. I would suggest orange juice. The acidity will neutralize the base. Now, munch on! Jeez, remember when jalapeños were hot? Now this. Three Dogs BBQ, I will try OJ. I eat peppers everyday and thought I could handle the Ghost. Not! cookiecrumb, When I was a wee lad jalapenos were an exotic forbidden fruit. Look at me now. Well the adventure wasn't all the way over at this point, right? Did it have any effects on your gastrointestinal system?